Day one of the second Test between West Indies and England in Antigua was abandoned after 10 balls because of a dangerous outfield. The West Indies bowlers were struggling to keep their footing on an outfield covered in sand following recent rain. After discussions between the players, umpires and match referee Alan Hurst, play was called off with England 7-0. England have asked for the match to be moved to the nearby Antigua Recreation Ground and talks are ongoing. "The bowlers are having trouble getting their footing - they were digging down in the sand and the turf was giving way," Hurst told BBC Test Match Special. "The umpires decided it was very dangerous and after talking to the captains decided it was unfit for play today. So we are going to look at the options available to us. What an absolute farce!!! How can you get to the start of a test match, begin play and only then decide that a pitch/playing surface is not fit for playing on?? Hurst rejected suggestions that with the outfield in its current state for several days leading up to the match, this scenario could have been avoided by switching the venue in advance. "There was no evidence (before play) that this would happen," he said. "We knew of the problems yet there was no evidence - but after two overs it became clear. "I'm not sure what is going to happen next - it is hard to see that there will be any improvement (at this ground). "I hate to think there are no other options available. We've just got to sit down and negotiate." Haroon Lorgat, chief executive of the International Cricket Council, said the blame lay with the West Indies Cricket Board, whose role it was to ensure a ground fit for play. Reports are emerging that the outfield and bowlers' run-up was not once tested since the stadium's only previous Test, which was a drawn match between West Indies and Australia in June 2008. The stadium was built for use in the 2007 Cricket World Cup. Lorgat added that every option was being considered to stage the match in Antigua and the ICC was extremely reluctant to move it elsewhere. That would leave only the Sir Vivian Richards Stadium - Lorgat confirmed the WICB were consulting specialists to assess whether the match could continue there - the Antigua Recreation Ground (ARC) and Sir Allen Stanford's ground. With the Sir Vivian Richards Stadium nets flooded in the build-up to the match, England conducted most of their preparations at the ARC. But that stadium last hosted a Test in 2006 and it is likely there would be huge logistical problems. Former England opener and Test Match Special summariser Geoffrey Boycott said: "They have to try and get a Test match played in Antigua. "The match referee, captains and West Indies Cricket Board should be going to see if it's possible to get a pitch prepared. If we have to start on Sunday, then let's do that. "This should be a huge embarrassment to the WICB and they should be moving fast to sort it out." Hugh Morris, the England and Wales Cricket Board's managing director, revealed that he wrote a letter to Hurst on Thursday evening expressing England's concerns. Morris added that England would not object to relocating the match to the ARC. "This is the game at the highest level - and this is not on," said Sir Viv Richards. "I had a go at some members of the Antiguan Cricket Association because it is alleged that they were given ample time to get the ground ready and do all the necessary supervising to make sure it was ready. "They dropped a ball somewhere and I'm appalled at some of these guys who say they are making decisions." Before play was abandoned, the players and umpires had already left the field for a rain delay. They soon returned but just two balls were bowled, with Fidel Edwards kicking up sand at every stride, before lengthy discussions ensured between the umpires, captains and Hurst. "It has been an absolute farce," said BBC Sport's Mark Mitchener at the Sir Vivian Richards Stadium. "We were not told anything, I only found out play had been abandoned from a text from someone back in London. "We only had a garbled message saying play had been abandoned about half an hour later. "Some people I know went to see the old Antigua Recreation ground yesterday, and the outfield there is clearly not playable." 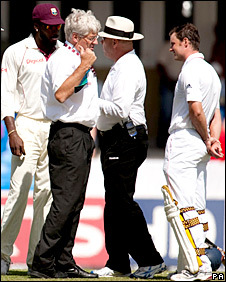 In 1998, the first Test between England and the West Indies in Kingston, Jamaica, was called off after less than an hour's play after both captains agreed that the pitch was unfit for play. OF COURSE THEY WAS NOT SLIPPING!